BIM Track is designed to enhance the collaboration workflow in your projects. It helps your team to communicate efficiently design issues and boost productivity in order to solve them and track them without any headache. Create, transfer and review your issues from different platforms accessible to the whole project team. You can use the add-ins or even a cloud based web application. BIM Track won’t let you down until the very last issue is solved. Custom reports and metrics make the tracking much easier so you can figure out if the project is still on track. Though BIM Track uses its own issue management system, it supports the BCF to give maximum flexibility in project environment. Creating, merging, archiving, group assignment and notifications make the user experience intuitive and pleasant. 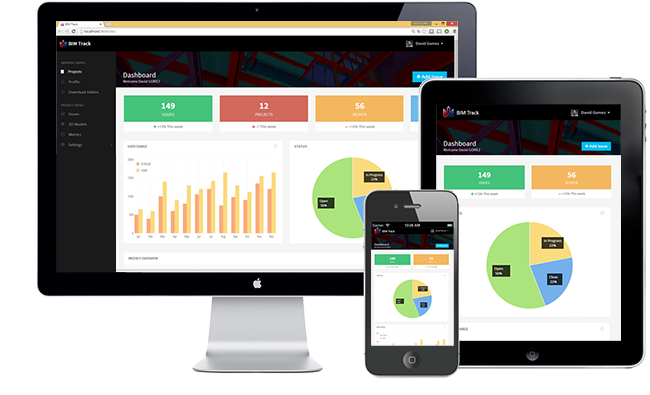 BIM Track is a cloud-based platform and does not require any installation to start using it. The platform allow the user to centralize all the coordination information from design to construction. From a PC or a mobile, from your office to the field, BIM Track allows you to access your construction project information anywhere, anytime. BIM Track provides powerful metrics to help you understand project management performance with charts and graphics. We promote OpenBIM workflow solutions and support IFC (Industry Foundation Classes) and BCF (BIM Collaboration Format). OPENBIM : WHY IS IT IMPORTANT? The platform will be released by the end of the year. In meantime, we need BETA testers to get feedback about BIM Track features. We invite you to subscribe and get an early access to the platform.